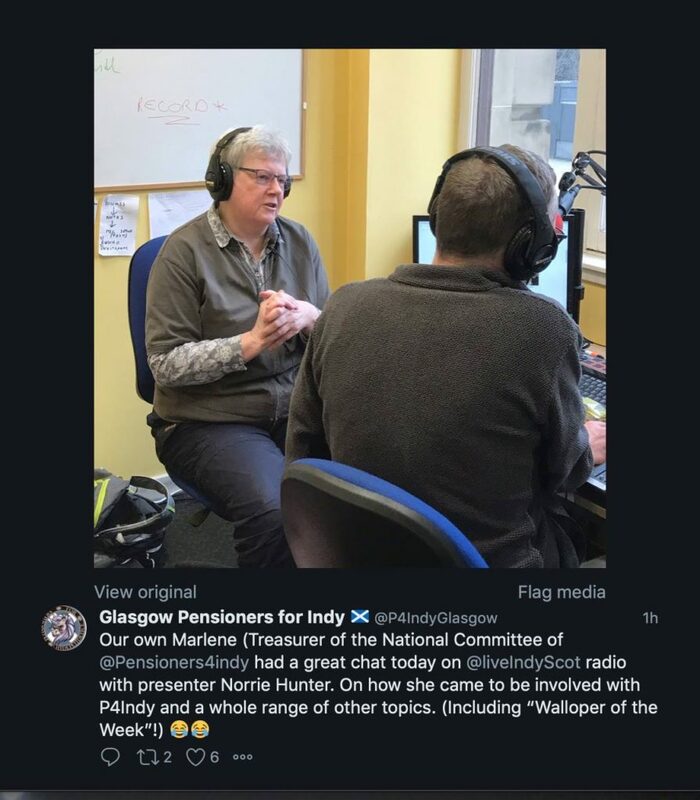 This is me, Marlene, on IndyLive Radio last week. I was a bit nervous about doing it but Norrie was very good at getting the ball rolling and keeping it rolling! Once I got into my stride, I really enjoyed it. I asked Val Gauld, our Glasgow Twitter person, along as well. As you can see she was tweeting as I was speaking. She joined in the chat, too. Norrie asked me about how P4Indy got set up. 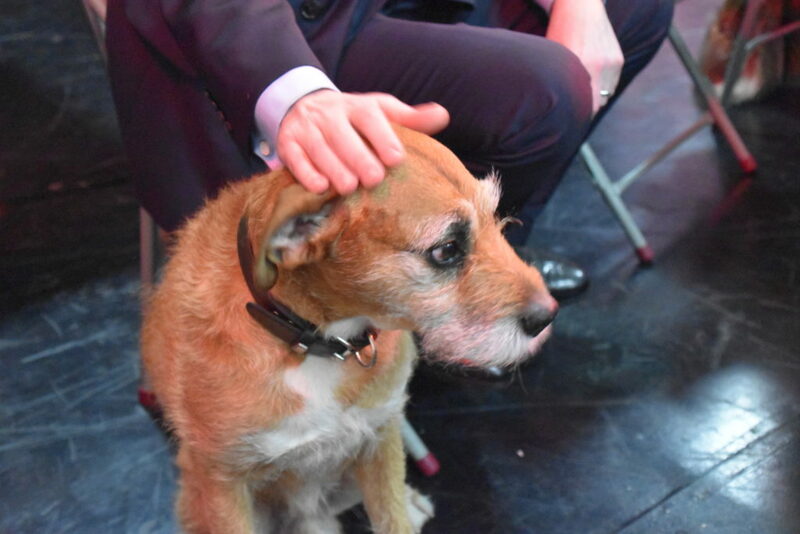 Then I had lots of time to tell his listeners about our AGM, about our push to help new P4Indy groups get off the ground and the funding we have for doing that, about the street stalls we run in and around Scotland, and about the Warblers, our concert party. 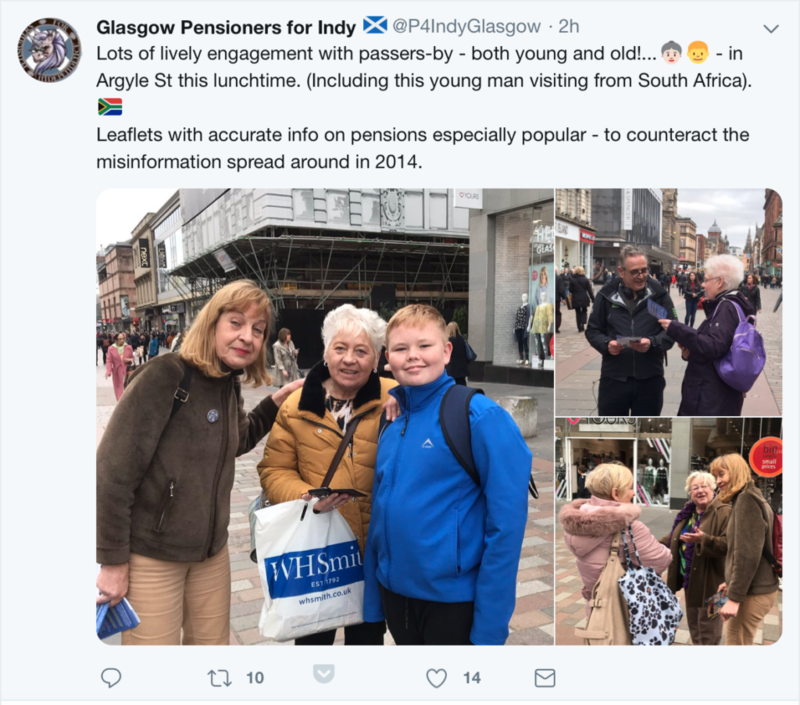 I also talked about the low numbers, only about 1 in 4, of over 65s who supported Yes in the 2014 campaign, some of the factors involved in that, and how we might engage with those. It does seem from recent polling done at the end of 2018 that more of our age group are coming round to Yes and it’s more like 1 in 3 support independence. Still some way to go and as I said to Norrie, it’s to help push that figure up that I joined P4Indy. The hardest question Norrie asked me was what song track I wanted to play as we took a wee break from speaking. I’m not much of a pop music fan but I lived through the 60s and 70s so I settled for a Beatles’ track. I suspect Norrie was humouring my very old choice! After that I got to present that week’s community announcements from The National. And I got to announce the “Walloper of the Week Award” which last week went to Labour MP Paul Sweeney for his rather over the top response to ScotGov’s wee video about us being open and welcoming country. He thought it was “smarmy, saccharine, bourgeois tripe”. If you want to find out what else the man said and what responses he got, look here. 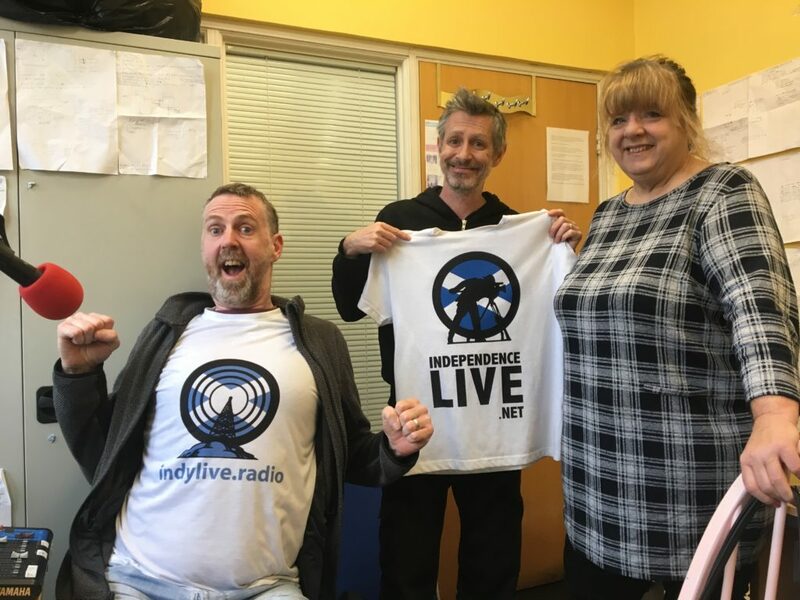 This entry was posted in Greater Glasgow, Indy News, News and tagged IndyLive, IndyLive Radio on 08/04/2019 by MmH. Over a period of a year as a Scottish Conservative Councillor there were three things that had radically transformed my political views from No to Yes. The first is the impact of Conservative policies on people and communities. As a new Councillor, I saw with my own eyes the impact the Conservative policies, especially DWP and welfare, had on the local people and communities. I have lost count of the amount of times I have met with various disabled people and those in difficulties who have been immensely impacted by the DWP at a local level. I, personally, have seen people reduced to tears because of Universal Credit, PIP, Access to Work and the Access to Elected Office Fund (UK). I also speak from personal experience that the Access to Work application and assessment process is far too bureaucratic, obstructive and is no longer fit for purpose. Quite frankly, it is a horrible process and many charities have the same concerns. The final straw was when I received an email from a team member of the Government Equalities Office in response to my open letter to the Minister for Women and Equalities. I had shared my delight in the Access to Elected Office Fund (UK) being reinstated for a year and urged the Minister to make it permanent. I also shared briefly how grateful I was for the support I received from the Access to Elected Office Fund *Scotland) and the positive impact it had on my campaign. The UK Government acknowledged there are certain barriers, but they also stated that the Access to Elected Office (UK) was being wound up and that the political parties are expected to have ultimate responsibility to meet extra costs for disabled candidates. I’m concerned the UK Government wants to shift the responsibility of costly unreasonable adjustments to political parties, like they do to employers with Access to Work, and like some employers, some political parties would not have a sustainable budget to meet the costly support needed. This would put a cap on disabled peoples ambitions to get into public and political life and certain types of work from anywhere in the UK. The second reason is the UK Government itself. In June 2017, I witnessed a snap General election with an unlevel playing field and a clear disadvantage for disabled candidates, thanks to the UK Government’s decision to not release the Access to Elected Office Fund (UK). I witnessed disabled people throughout the UK who would have loved but were unable to stand as MP candidates, including Scottish candidates, as they could not afford the support needed thanks to the Access to Elected Office Fund UK being reserved (had it been devolved it is likely the Scottish candidates would have had received funding from the Scottish Government). Some of the political parties did not have the sustainable budget to provide nor had the time to fundraise for a snap election. Those that did manage, had to pay extra on top of the campaign itself. This example made me wonder if the same could potentially happen to the Access to Elected Office Fund (Scotland) if the Scottish Conservatives ever got elected into the Scottish Government. All this demonstrates what life is like for disabled people under the current UK Government. It also made me wonder, what kind of society do I want to live in – a society under a selfish government that looks for any excuse to not support disabled or vulnerable people and favours the rich? Or a society where together, we can work for the removal of barriers to people’s economic, social and civic inclusion, and to promote our rights, choices and voices, as full and equal citizens? I decided to resign from the party because I refused to give up our right to participate in work, politics and in society on an equal level playing field under the current UK Government that wants to remove or alter policies that puts a cap on our ambitions. The third reason is my belief in self-governance. Along with all the other City of Edinburgh Councillors, we have the privilege to govern the Capital City of Scotland, and in my first year as a Councillor I saw with my own eyes how we run our City via the Council. We also received some insight into the various roles MSPs and MPs have due to working cross-government on various issues. Over time, it became more glaringly obvious to me the absurdity of reserved matters being dealt with by Westminster and not by the Scottish Government (bear in mind I voted No), as Scotland is capable of governing on reserved matters too. I became more convinced that Scotland needs political independence to build a different and better Scotland. I have been brought up with the UK as my Country, and all my life I had seen the whole of the UK as my homeland. I don’t want to see new borders as I’m about finding new and practical ways to break down barriers and unite people as central to one of my progressive values. But I came to the realisation that to preserve and protect the values we have in Scotland we cannot have policies imposed on us from Westminster that jar with the kind of Scotland we are trying to build. So simply, we need independence. Scotland’s traditional liberal values of freedom, tolerance, equality, and individual rights need to be protected. 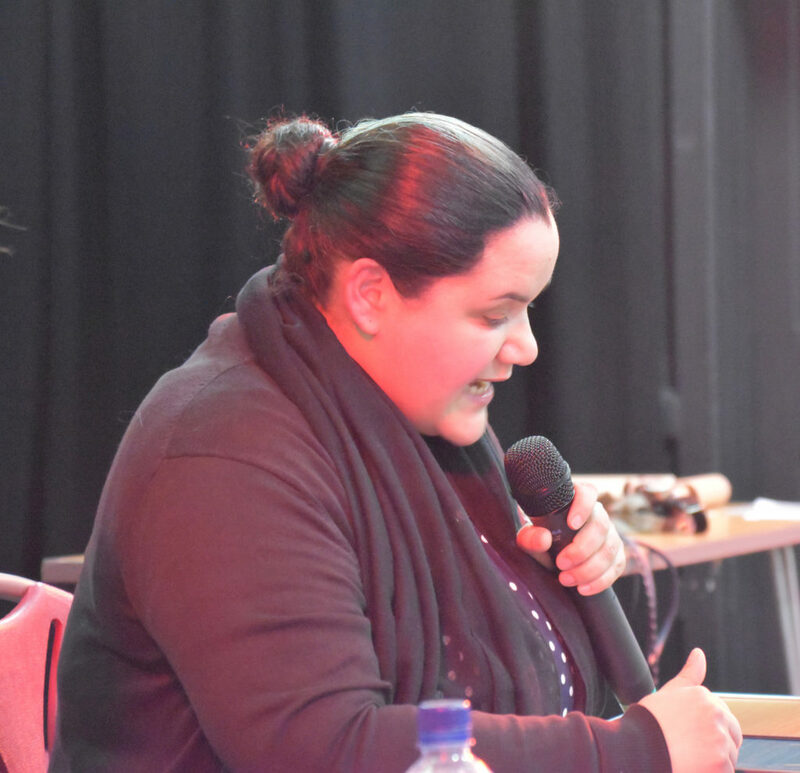 It was a question of which values were more important to me to serve in my ward, after all I campaigned under the vision of ‘Communities that Work for Everyone’ and I believe the Conservatives and UK Government cannot deliver that aspiration. What I personally struggled to come to terms with, was that for Scotland to get political independence we need to break up my homeland. We need to break up the old Union which does not work with devolution and work together as a new Union of Independent Nations as Equals cooperating with our UK neighbours on an equal footing while the Scottish people control their own destiny. 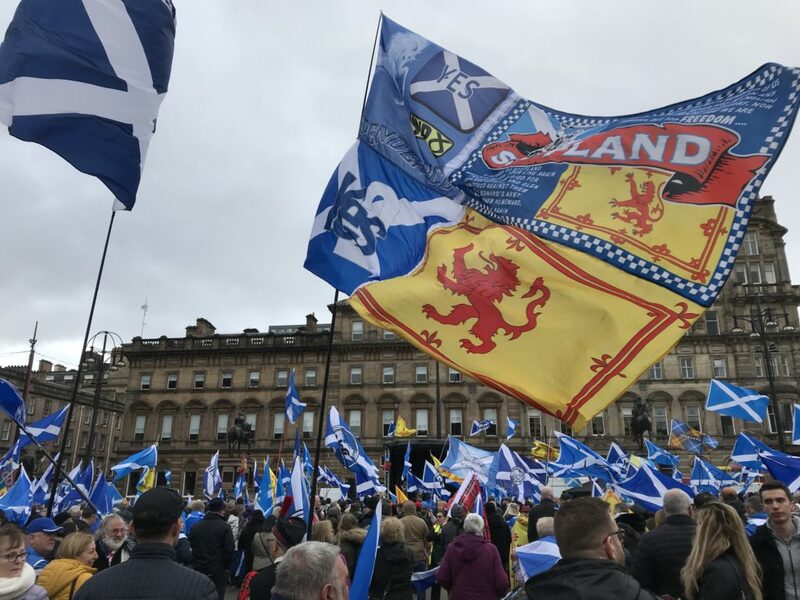 I believe it is time for Scotland to have political independence, to self-govern with the full freedom to build and shape Scotland’s future by our own hands the kind of country we want it to be and the kind of Government we want to have (one with a caring heart!). Yes, I freely admit we need to find new and practical solutions such as, the kind of currency we will have, the kind of central bank, and so on, but we can work, discuss, debate and share ideas together to find these solutions and build on the vision of an independent Scotland into reality. Heck, if we can invent televisions, telephones, penicillin and insulin, to name a few – surely, we can create ways to self-govern our Country? Didn’t these inventions all start with a vision from those who could imagine a different future? 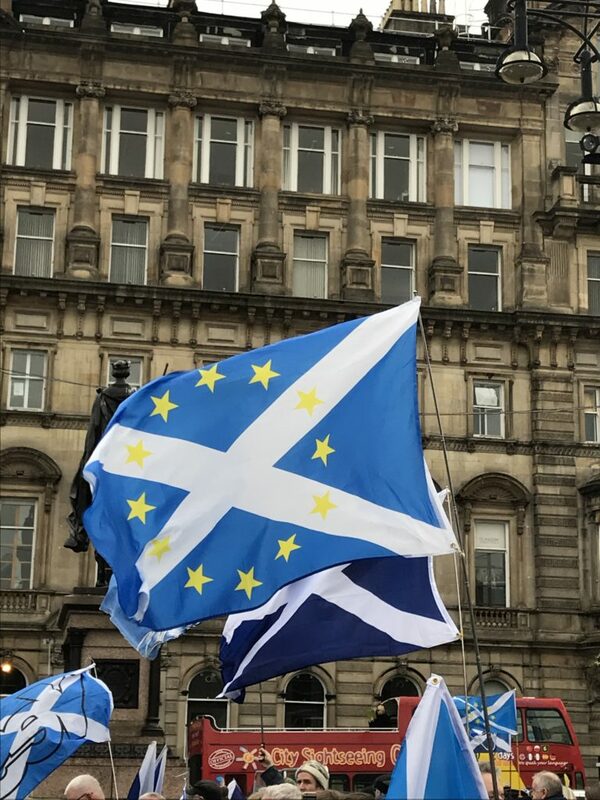 The increasingly safe and sensible choice seems to be for Scotland to stay at the heart of Europe, independent and in control of our own destiny. It is time to embrace YES with full confidence in our future. This entry was posted in News on 04/04/2019 by MmH. 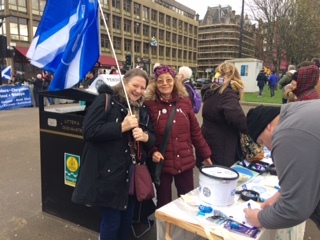 Despite the miserable rainy morning we decided to go for it and get the Glasgow Group stall along to the Hope Over Fear Rally. It was a good call. The sun came out. And Mary, Neil & dug. Heather, Valerie & myself all enjoyed the experience. Even with rather gusty winds which put our stock of leaflets in danger of being blown away! The atmosphere was happy and positive – which cheered me. There was a good range of age groups and many 50+ men & women came from all over central Scotland. Some America visitors joined us too. One chap asked if we were celebrating our independence day! 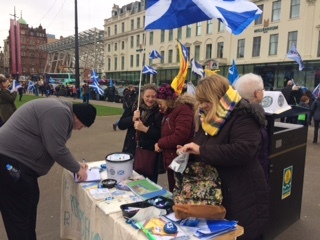 People were very generous with donations and all our saltire earrings, flags, and painted stones were disappearing quickly. Heather’s pained stones were popular with children though she made them to hold down our leaflets in the wind! We did find time to take some photos. This was also the occasion of the first tweet in our @P4IndyGlasgow twitter feed and as you can see from the stats it was a well-received tweet. Two days after that we had 1700 Twitter followers. Well done Val for setting it up and being our tweeter person! This entry was posted in News on 01/04/2019 by MmH. Maybe it’s all the excitement about setting up The Warblers – Glasgow P4Indy music group – now we’ve also started tweeting!! Our first tweet was from in George Square, Glasgow, at the Hope Over Fear Rally last weekend. That tweet now has 867 likes, 69 replies and 407 retweets. That’s a very encouraging start. 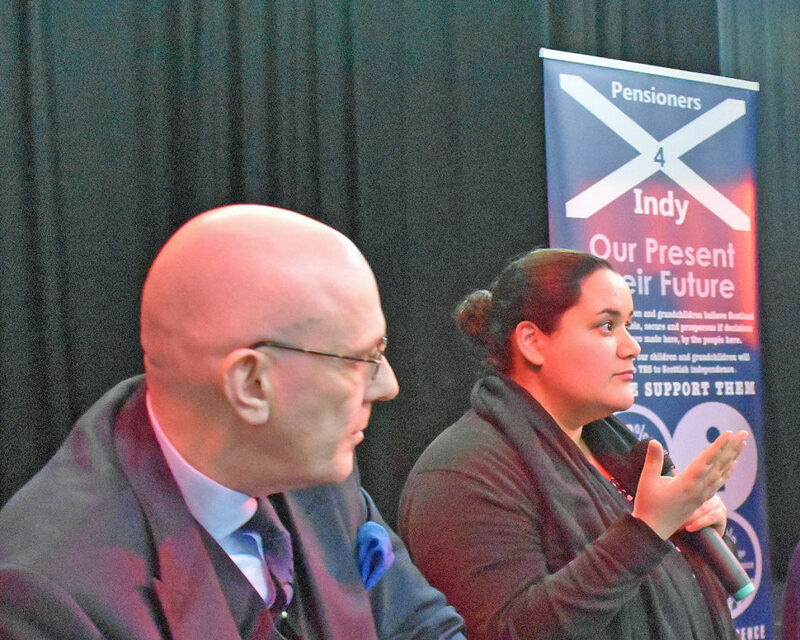 The more we raise P4Indy’s profile, the more people see what we are doing to encourage older folk to engage with the Yes Movement. An hour after our first tweet, we had 100 followers. Overnight that grew to about 1000. We’ve had lots of appreciative tweets and mentions. Five days on and our Twitter feed has 1740 followers. There’s obviously a good few folk out there who appreciate what were doing in Pensioners 4 Indy! Some of them were speaking to us this morning in Argyle Street at our regular Thursday spot from midday. If you’re a Tweeter, follow us @P4IndyGlasgow for P4Indy news, updates from our website, photos, and news from around the Yes Campaign. There is also @P4Indy which is the Twitter feed for our National Group P4Indy. This entry was posted in Greater Glasgow, News on 28/03/2019 by MmH. Last month the Glasgow P4Indy had a visit from Bill Mills talking to us about Reframing. 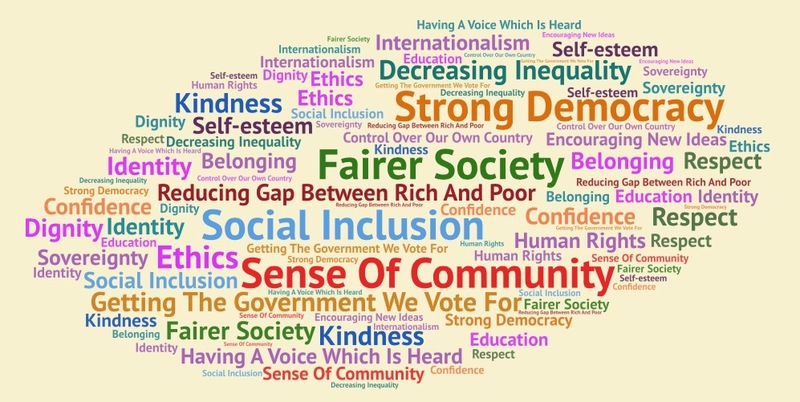 This month we wanted to explore his ideas from different angles so we created a workshop format looking at the values we associate with an independent Scotland. 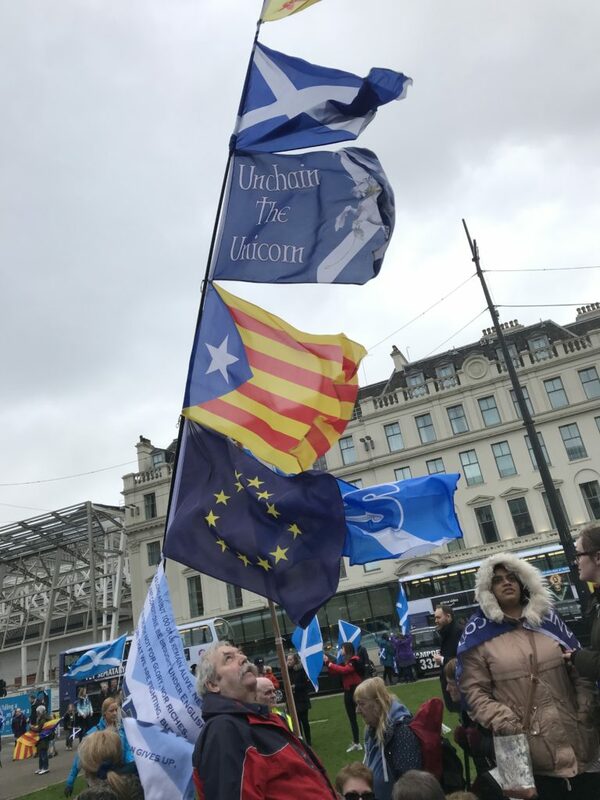 We did two workshops – one about values we as Yes voters associate with independence; and another about values which led No voters to reject independence. Of course we’re Yes voters so we might not be correct in the values we think influenced No voters! But we’ve got experience of talking to No voters in our family, in meetings, on buses, and at our stalls. it was interesting to see what came out of this. We could understand why people were / are influenced by these things. 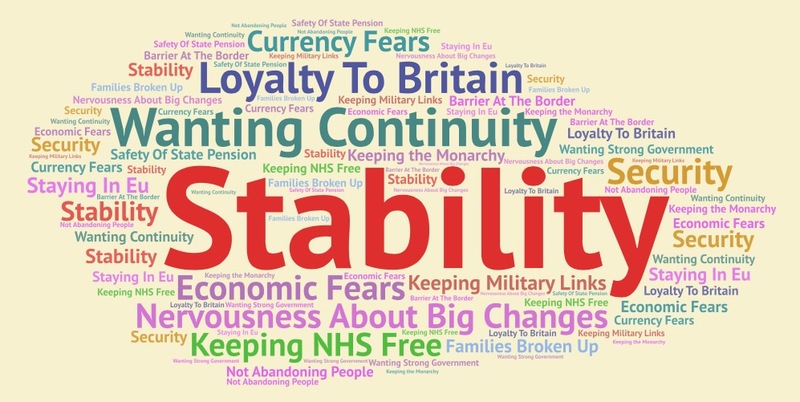 We’ve put the results of these workshops into word clouds. These are not definitive results. We could do the same workshop with a different group of people and get a different word cloud. But we think there would be a big overlap with what we came up with. This is not in any way to denigrate the values we placed in the No cloud. Actually there is overlap between the two clouds. Some are sort of mirror images of each other. There is definitely a relatedness between the two and we think being more aware of that relatedness is helpful. After going through this, we had a better sense of where our values and thinking overlaps with No voters. Of course there’s not a neat match. But it did suggest things that could help us in reframing our conversations.. Ways in which we might reframe our own thinking. And ways in which we might manage to suggest new frames for their thinking. It’s not easy to change frames. This is definitely a work in progress! This entry was posted in Greater Glasgow, News on 03/03/2019 by MmH. 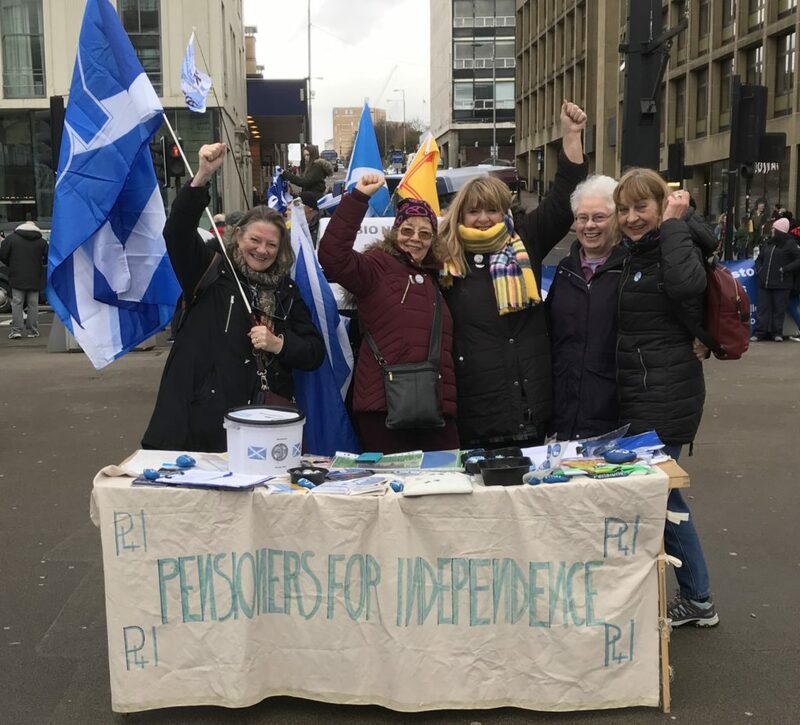 A couple of months back I wrote about the Glasgow P4Indy group’s choir – The P4Indy Warblers. In December we were practising carols and hoping to be able to sing in pensioners’ sheltered housing complexes or in residential homes. We didn’t manage to get any gigs for our carol singing . But we thought maybe we could get some for Burns week. So we kept on practising together and moved on to Burns songs. We even practised a few Burns poems. 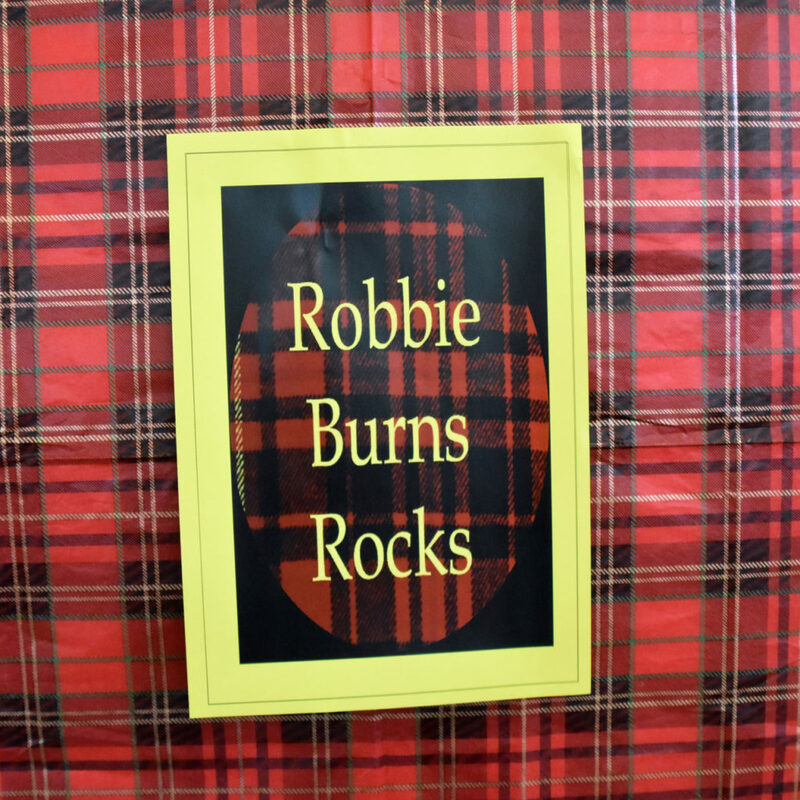 We had one appearance lined up at the Maryhill Women’s Centre to sing, recite and play for their Burns Lunch on the 22 Jan. Then suddenly we found ourselves with another two requests for later on that week, one in Carntyne and one in Dennistoun. It was a busy singing week and throat sweeties were a necessity! We really enjoyed those gigs. We were a bit rough round the edges but we had very forgiving audiences! And we’ll be carrying on practising together. We have other appearances lined up over the next few months. 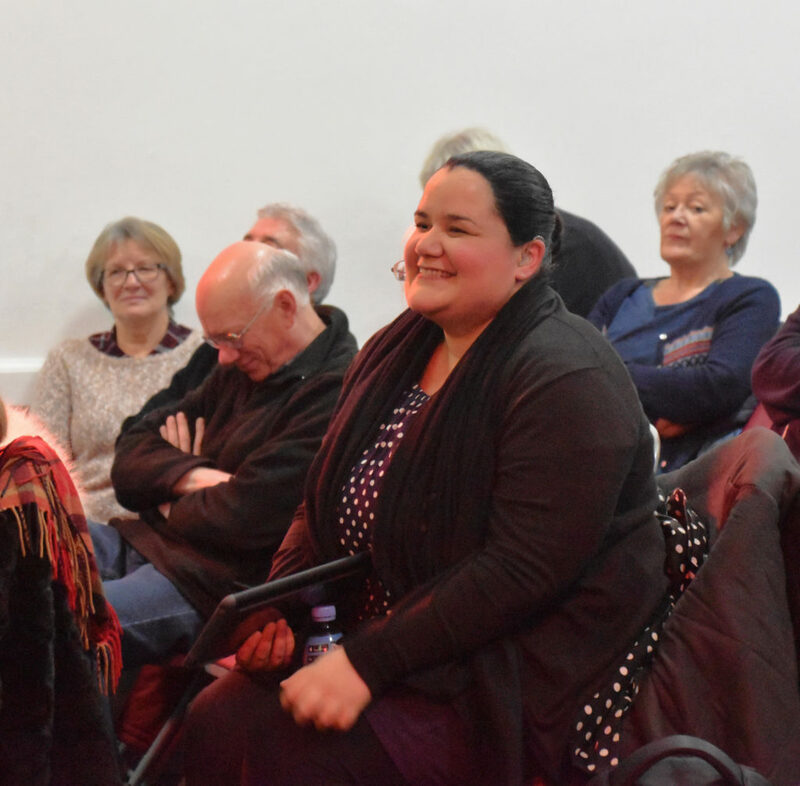 We could do with more people in the singing group….. so if you can sing a bit, or play a bit, or recite a bit…. get in touch using the Contact Page. This entry was posted in Greater Glasgow, News and tagged Burns Week, P4Indy Choir, Warblers Choir on 04/02/2019 by MmH. 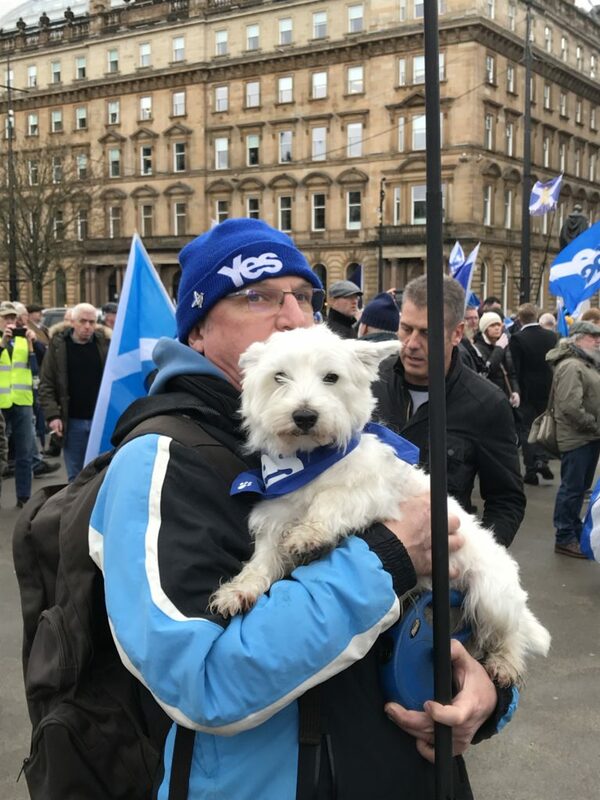 P4Indy Choir – Come and join us! Yesterday was the first meeting of the Greater Glasgow P4Indy Choir! 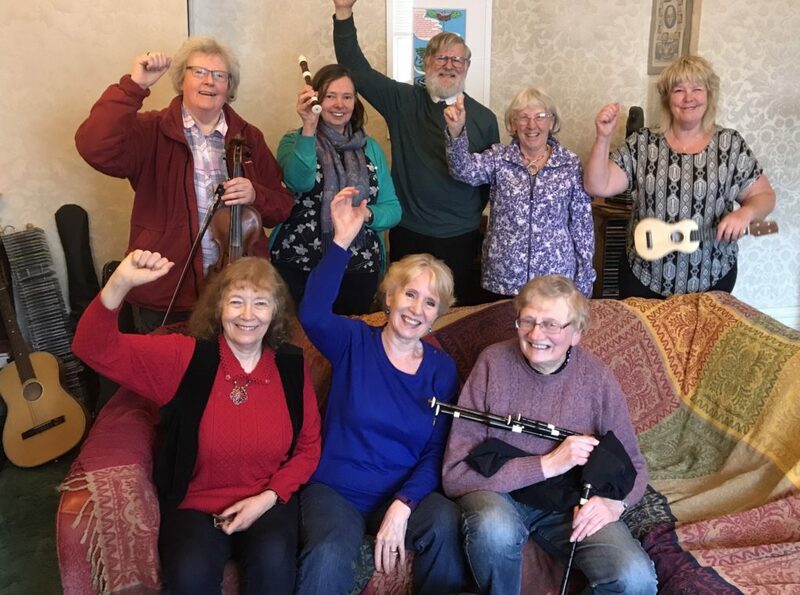 Alan Logue, convenor of the Greater Glasgow group, suggested at a recent meeting that if we had an entertainment group then we could offer to go to pensioners’ lunch clubs, and day centres. Alan’s idea has been enthusiastically taken up by Mary McCabe, another Glasgow group member, who suggested that we could form a choir! 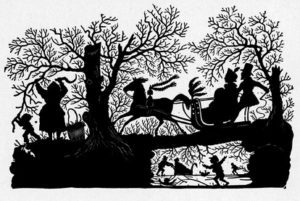 This entry was posted in Events, Greater Glasgow, News on 06/12/2018 by MmH.